You will rarely read a book written in a more courageous, intelligent, and blunt manner about profoundly pressing world problems than this one. 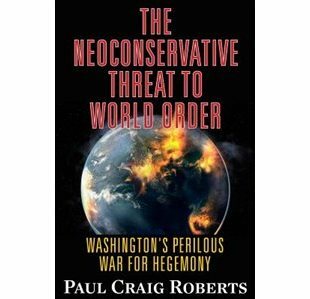 Paul Craig Roberts is a phenomenon; no issue, no matter how controversial, escapes his astute analysis. He writes with a tornadic power and logic that convinces as it challenges. Driven by a passionate concern for the horrible direction of the world – especially the United States government’s responsibility for so much of its wretchedness – he is relentless in roiling the waters of ignorance and complacency in which so many Americans float. A former Assistant Secretary of the Treasury for Economic Policy in the Reagan administration and a columnist for the Wall Street Journal, Paul Craig Roberts (image right) has escaped all easy labels to become a public intellectual of the highest order. He is a prolific critic of U.S. foreign and domestic policies, with a special emphasis on the nefarious influence of the neoconservatives from the Reagan through the Obama administrations. A savage critic of the mainstream corporate media – he calls them “presstitutes” – he dissects their propaganda and disinformation like a truth surgeon and penetrates to the heart of issues in a flash. Once in place the Wolfowitz Doctrine resulted in the Clinton regime abandoning the guarantees that the George H. W. Bush administration had given to Gorbachev that NATO would not move one inch to the East. In violation of the U.S. government’s word, former Warsaw Bloc countries were incorporated into NATO. Then NATO was used to attack Yugoslavia and Serbia. Then the George W. Bush regime withdrew the U.S. from the Anti-Ballistic Missile Treaty and began locating anti-ballistic missile bases on Russia’s borders. Washington orchestrated “color revolutions” in the former Russian provinces of Georgia and Ukraine. When the Orange Revolution failed to deliver Ukraine into Washington’s hands, Washington spent $5 billion cultivating Ukrainian politicians and creating pro-American Non-Governmental Organizations (NGOs) that were used in Washington’s 2014 overthrow of the elected government of Ukraine. Read chronologically, these essays reward a careful reader with an understanding of the progressively menacing steps taken by the Obama administration, including the announcement that the United States is sending battle tanks, heavy equipment, and thousands of troops to be permanently stationed in Eastern European countries surrounding Russia. If the shoe were on the other foot and Putin was sending the same to Canada, Cuba, and Mexico, one would hear howls of outrage emanating from the New York Times, CNN, and the Washington Post, etc., media stenographers for Washington. So the reader is enlightened but not encouraged. But this is not Roberts’ fault. He is being truthful. He is a Cassandra warning of future disasters if people don’t awaken from “a false reality created for them by their rulers.” He admits that he struggles with people’s reluctance to seek truth every time he writes a clarifying essay. Yet he is of two minds – hopeless and hopeful. He intimates that even if people awaken, the neoconservatives will maintain their power in government and media. Yet he stalwartly soldiers on, hoping to change minds, which suggests he believes at some level that changing minds has a chance of changing structures of power and ideology. His vacillation in this regard is understandable. Thankless as the task may be, Roberts elucidates many issues besides Ukraine, so these essays can also be read as self-standing analyses: 9/11 and the anthrax attacks, the case for impeachment of U.S. presidents, war crimes by U.S. officials, American “exceptionalism,” Operation Gladio, “Washington’s Iraq ‘Victory’,” European governments’ collusion with the U.S., the CIA and its media control, the Charlie Hebdo attacks, the war on terror, false flag attacks, etc. His reach is capacious and his analysis penetrating. He questions, probes, presents facts, and admits when facts are not conclusive. Impeccably logical – and straightforward – he forces the reader to reevaluate their understanding of these issues. And he references other fine writers and researchers who support and extend his points. While correct about the rise in power and evil influence of the neoconservatives over the past thirty years or so, I think Roberts’ understanding of the machinations of secret deep state forces going back to Operation Gladio and the assassinations of JFK, RFK, and MLK, suggests he knows that the neocons are but a recent example of an old problem. The US drive for hegemony has deep roots and a long history. Wall Street, the banks, and the CIA have been entwined for many, many decades. Overthrowing governments, propaganda, assassinations, and instigating wars are their specialty. None of this is the exclusive bailiwick of neoconservatives; they are just a current, execrable example. Behind them, and liberals and conservatives of all stripes, sit powers that transcend nomenclature. I’d like to see him give more emphasis to U.S. strategy as a long-standing continuum, though this does not detract from his astute analysis of the neoconservatives. After all, these essays were written on the fly as the neocons policies were being carried out by the “liberal” Democrat Obama. So if you want truth, read The Neoconservative Threat to World Order. It’s journalism at its best.